Mumbai Indians (MI) will host Kings XI Punjab (KXIP) in the match 24 of Indian Premier League 2019 (IPL 2019) at the Wankhede Stadium in Mumbai. This will be the second encounter between Mumbai and Punjab this season. In their earlier meeting in Mohali., Kings XI Punjab emerged victorious by eight wickets. And now Mumbai Indians will be looking to take revenge in front of their home crowd. Mumbai Indians vs Kings XI Punjab Live Cricket Score. It is going to be warm in Mumbai on Wednesday. However, during the match time, the temperature will come down. As per accuweather.com, the temperature will be around 29-30 degrees pots 8 PM in Mumbai. There is no chance of rain. The conditions are expected to be humid with over 70% of humidity during the game time. MI vs KXIP Head-to-Head Record: Ahead of IPL 2019 Clash, Here Are Match Results of Last 5 Mumbai Indians vs Kings XI Punjab Encounters!. Pitch Report: Wankhede Stadium is one of the high scoring venues in India, especially in IPL. The pitch, once again, is likely to be a batting-friendly one. In the two matches at the venues this season, so far, teams have won while defending. In the first match, Delhi Capitals defended 213 while in the second Mumbai Indians defended 170. MI vs KXIP, IPL 2019 Match 24, Key Players: Chris Gayle to Alzarri Joseph to KL Rahul, These Cricketers Are to Watch Out for at Wankhede Stadium. 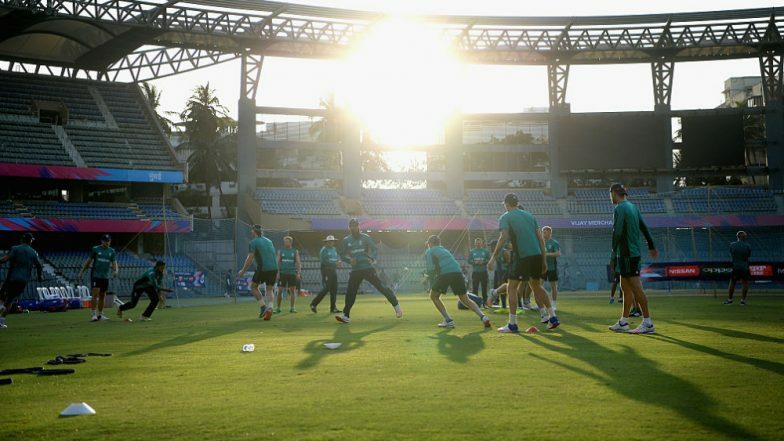 Mumbai Indians Squad: Rohit Sharma(c), Quinton de Kock(w), Suryakumar Yadav, Ishan Kishan, Kieron Pollard, Hardik Pandya, Krunal Pandya, Rahul Chahar, Alzarri Joseph, Jason Behrendorff, Jasprit Bumrah, Yuvraj Singh, Anmolpreet Singh, Aditya Tare, Siddhesh Lad, Evin Lewis, Pankaj Jaiswal, Anukul Roy, Ben Cutting, Mayank Markande, Mitchell McClenaghan, Barinder Sran, Rasikh Salam, Jayant Yadav. Kings XI Punjab Squad: Lokesh Rahul(w), Chris Gayle, Mayank Agarwal, David Miller, Mandeep Singh, Sarfaraz Khan, Ravichandran Ashwin(c), Sam Curran, Ankit Rajpoot, Mohammed Shami, Mujeeb Ur Rahman, Karun Nair, Simran Singh, Nicholas Pooran, Murugan Ashwin, Andrew Tye, Hardus Viljoen, Arshdeep Singh, Varun Chakravarthy, Darshan Nalkande, Agnivesh Ayachi, Harpreet Brar, Moises Henriques.